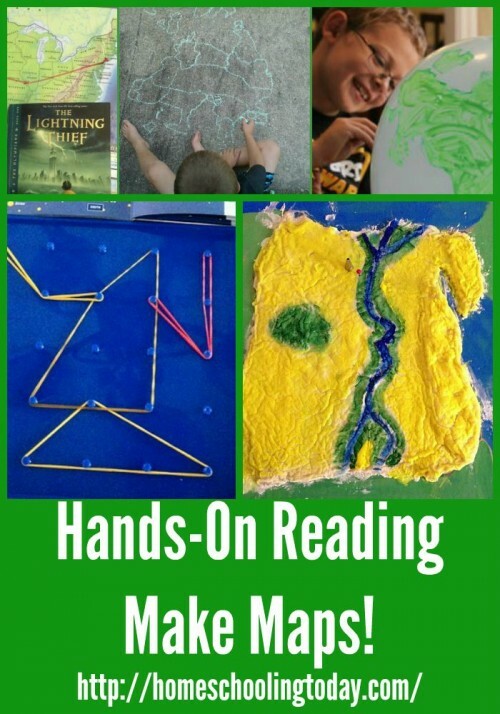 Homeschooling Today magazine | Hands On Reading – Make Maps! We love to read books, but it’s not always easy for my hands-on learners. They want to jump into the story and create something. When we started to make maps their listening skills magically improved. Whether you’re reading an early reader book, Henry the Castaway, or an older reader book, Percy Jackson Series, consider the possibility to make maps after your reading time. Fiction books offer a great opportunity to create new lands and far away places. Non-fiction and biographies offer a great opportunity to create real places (and knock out a Geography lesson). Always check the first few pages and last few pages of a book for a map. 1. Salt Dough Maps. Salt Dough Maps are easy and require only 3 ingredients: salt, flour, and water ~ plus a cardboard box. We like to use pizza box tops as the base for our maps. These maps are fun for hands-on learners, but do require some time for drying, painting, etc. 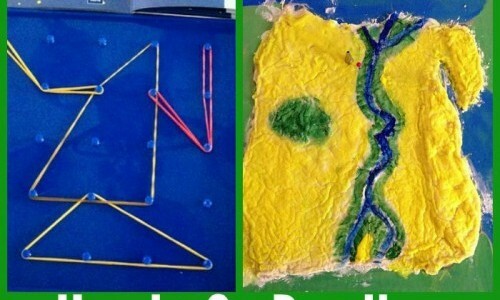 Salt Dough Maps are perfect for elevation changes, volcanoes, or great island adventures. 3. Balloon Maps. Not sure what to do with that bag of balloons? Draw a map, continent, or country on the balloon. You can also draw planets on each balloon for a space adventure. Tie yarn around the end of each balloon and hang the line of balloon planets in a room for out of this world fun. 4. Constellation Map. Early explorers used the stars as maps, so make constellation maps. You can try the marshmallow toothpick kind, or just dot out white marker stars on black construction paper. We like to use the Night Sky app to see what stars our in our night sky. 5. Neighborhood Map. Bring your map making skills close to home and map your neighborhood. For early learners start with your street and then keep growing as you take more trips around town. Add a new building, park, or place each week. Outgrow a page? Tape another page together and see how big this map gets by the end of the school year. This will make for a fantastic geography project. Stef Layton lives in Orlando, Florida homeschooling two tactile learners. Stef is the Hands-On Learning Columnist for Homeschooling Today magazine. This year she started showing hands-on activities on YouTube. You can follow her on Instagram or Twitter @StefMLayton. I love these different map ideas! I remember making a salt dough map in elementary school. It was so much fun!